This little picturesque town is placed on the right bank of river Krka, some 15 km from Sibenik. If you're taking the Zagreb-Split highway, take a break at Krka rest-area and enjoy the incredible view of this gem of nature. You can't leave Skradin without tasting its traditional specialties. Skradin's risotto, the famous Skradin’s cake, koprtlje, an autochthon specialty of Skradin. The entire city centre is a protected cultural monument. One of the guests who has recognized the beauties of Skradin and has become regular visitor of this lovely town is Billy Gates. Boats drive from Skradin to Krka National Park, or more precisely to Skradinski Buk. This is probably the best way to visit the Park (you can get there with 5 different entrances), because the perfection of entering the beauties of the National park starts on the boat already. If you're a cycling lover you can rent a bike in Skradin and ride along the bike track all the way to Skradinski Buk. Don't forget your bathing costume, because water here is suitable for swimming. 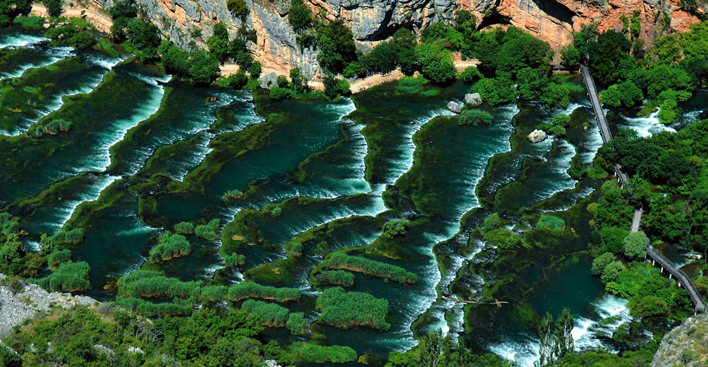 During summer months the temperatures of Krka River don't get higher than 19-20 degrees Celsius. 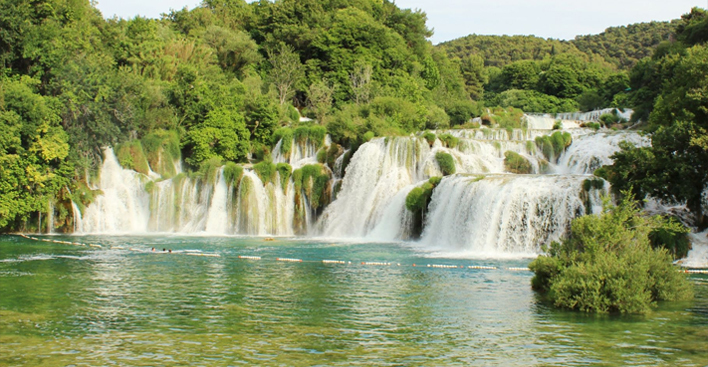 Krka National Park is a phenomenon of nature with its seven travertine waterfalls and a total downfall of 242 meters. The endless greenery, burble of the river, travertine cascades, islands and lakes, visitors can also enjoy sightseeing the remains of Burnum, the roman military camp, medieval forts Trosenj and Necven, the little island of Visovac, Monastery of Krka or St Archangel. 7 sea miles from the island of Murter, or 15 miles from Sibenik and Zadar, is where Kornati archipelago is situated, with its 150 magnificent islands and cliffs. Every first Sunday in July you can witness a pilgrimage of hundreds of boats towards the Tarac bay, the home of the luscious Church of Madonna of Tarac. No wonder that this event has become some kind of tourist attraction, since it's definitely one of the most interesting religious events in Croatia. One of the things that will make your heart beat faster are magnificent steep cliffs, the famous 'crowns of Kornati'. They can rise up to 80 m above sea level, with the extensions underwater going down to 100 m. The highest of them is on Klobucar island. You can visit Tureta Fort, a Byzantine building dating 6th century, on the island of Kornat. From the top of Kornati peaks, you'll enjoy probably the most amazing panoramic view in the world. The highest peak of the National Park, Metlina, is also found at the island of Kornat. According to old Croatian mythology Kornati arose when a giant named Kornat and his army of giants, unaware of the trap set by Tatomir, the god of Moon, was defeated by gods, who used the bodies of his soldiers to make Kornati. Back in 1936, Edward VIII, the king of England, was seen cruising the Adriatic with his Wallis Simpson. They spent a part of their journey at Kornati, and it's said that in the intimacy of this enchanting miracle of nature he decided to renounce his crown in favor of his beloved woman. Apart from the privacy and intact beauties of these islands, one of the magnets for celbrities is definitely the gastro offer of incredible Kornati restaurants. The perfect atmosphere, lovely structures, freshly caught fish and lobsters, home made olive oil often cultivated and produced by the owners themselves, and of course rich wine lists of exquisite red and white wines. Kornati archipelago is so fascinating that you'll start to think it was made by alien forces or even God himself. Words are not enough, you'll just have to come and see for yourself.